Wycheproof, a rural town on the Calder Highway, is 120 km north-west of Bendigo. It was named after the Wycheproof pastoral run (also known as the Avoca pastoral run) taken up in 1846. The name is thought to be derived from an Aboriginal word meaning rushes or grass on a hilltop. Mount Wycheproof, 43 metres from base to summit, is 800 metres east of the township’s main street. Farm selections were taken up in the Wycheproof district in 1873, and the Mount Wycheproof Hotel was opened in 1874. A reserve for the township and railway line was surveyed on a site west of the mount and building commenced there in 1877. The main street, named Broadway, was three chains (60 metres) wide, with provision for the railway line along the middle. A school was opened in 1876, and Catholic, Anglican and Wesleyan churches within two years. During the 1880s development was pronounced. It began with the publication of the newspaper, the Ensign (1881), followed by the extension of the railway line from Charlton (1883), a flour mill (1884-1925), a mechanics’ institute (1884-1935) and formation of an agricultural and pastoral society (1885). Wycheproof achieved civic importance with the opening of a court house (1890) and when the district was severed from the east of St Arnaud shire and proclaimed Wycheproof shire in 1894. Wycheproof had been a railway terminus from 1883 to 1894, when the line was extended to Sea Lake. A goods shed had been built at the station in 1884 and a growers’ cooperative built a 120,000 bushel grain shed at the station in the following year. The flour mill was also nearby. Silos and bulk handling replaced the grain shed in 1936-37. Upwards of 250,000 bags of wheat (eight times the shed’s capacity) would be stacked at the yard during a good harvest. The station employed up to 20 staff. 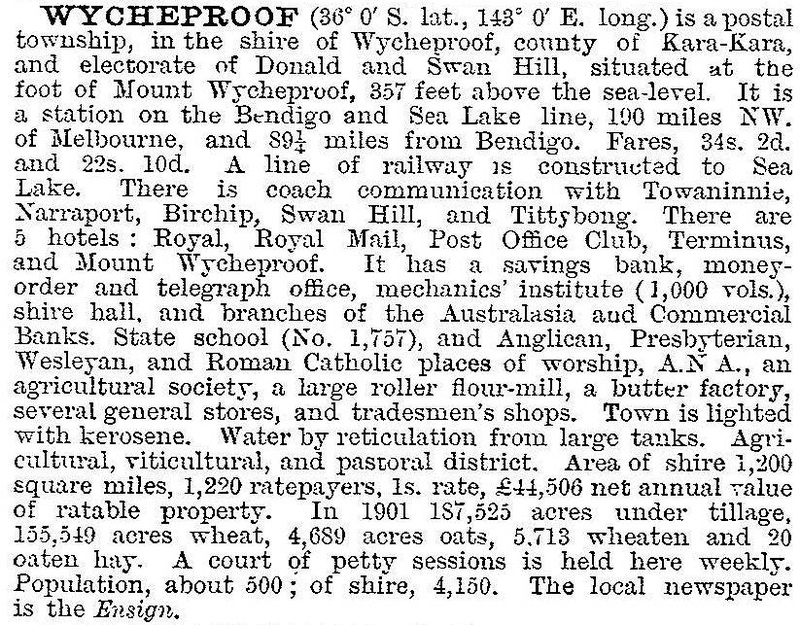 Wycheproof’s population reached 1000 in the 1933 census and kept at that level for the next 40 years. The 1980s and 1990s however, witnessed a census decline of about 25%. In 1928 the primary school added higher elementary grades, and it has become a P-12 facility with 124 pupils in 2014. There is also a Catholic primary school. The original hospital was replaced in 1938 and a new shire hall was built after the loss of the mechanics’ institute. Centenary Park was created from a derelict reserve during one of several Back To Wycheproof celebrations in the 1960s and 1970s. An early sign of declining rural population and the shrinkage of distances was shown by the amalgamation of the newspaper with its counterpart in Sea Lake at the northern end of the shire. The Sea Lake and Wycheproof Times Ensign (1971) continues as a weekly. Wycheproof has a comprehensive array of amenities. There are a hospital, an aged persons’ hostel, a golf course, a race course, tennis and bowling facilities, a swimming pool, two reserves, State and Catholic schools, four churches, two hotels, a motel, a caravan park, stockyards and a million bushel grain silo complex. The railway station (1887) and the former court house (1889) are on the Victorian Heritage Register and there is a historical museum. Wycheproof is the administrative centre of Buloke shire, which absorbed Wycheproof shire in 1995. In a bid to increase local population, two families from outside the district were selected from over 100 applications to take up farmhouses in the rent a farmhouse scheme for $1 a week in 2009. At the 2011 census, the median age of Wycheproof’s residents was 53 years (Victoria, 37 years). In the Wycheproof district livestock and grain farming accounted for 26% of employment (2011 census).